Brantford – Students at Wilfrid Laurier University’s Brantford campus are encouraging appreciation and respect for diversity through art-centred education. Laurier’s Yellow Brick Wall gallery features an exhibit titled The Diversity Art Series, which runs until April 27, 2018. 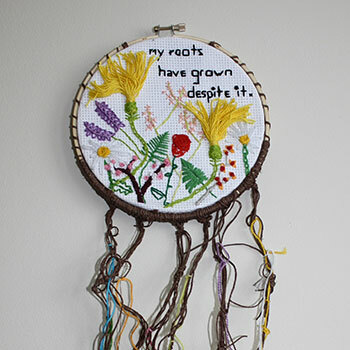 The Diversity Art Series features 10 artworks created by Laurier students and members of the community, who use their creativity to investigate contemporary social justice issues. The exhibit is part of ongoing efforts to illuminate narratives of those impacted by systemic inequities, shedding light on barriers that inhibit access to equal opportunities. Five of the 10 artworks are a small sampling of many submissions to the (Un)Silenced art project. “(Un)Silenced claims space for survivors of sexual violence to creatively reflect upon their experiences, to shout feelings, disappointments and pain out to the world, and to celebrate resilience, in whatever ways feel best,” said Karly Rath, a member of Advocates for a Student Culture of Consent (ASCC), a Laurier Students' Public Interest Research Group (LSPIRG) community research and action group. Through the exhibit, ASCC is challenging viewers to broaden what comes to mind when thinking about those who have experienced sexual violence — beyond what they see in the media. The group hopes that other survivors who visit the exhibit feel validated in the diversity of experiences and feel encouraged to exist on their own terms. “Together, the artwork resists dominant narratives about sexual violence, where representations of survivors in both the media and our daily lives do not reflect our bodies, races, sexual orientations, religions and genders —let alone our needs, personalities and strength. Survivors’ stories and lived experiences should not be flattened or silenced,” said Rath. Another piece, titled “Hated in the Nation,” created by first-year student Destiny Pitters, focuses on the subject of police brutality, where African-Americans are often seen as major casualties. “I used art to bring light to this tragedy and encourage our community to carry on the conversation,” said Pitters. Through art, the Diversity Art Series aims to educate the community in an interactive way as part of equity and inclusion efforts at Laurier. The Yellow Brick Wall is the exhibition venue at the Brantford campus of Wilfrid Laurier University, located at 97 Dalhousie St. It is designed to provide appreciation and enjoyment of Canadian art to members of the Laurier community and beyond. The Yellow Brick Wall aims to contribute to the growth of students, encourage dialogue and reflect the diversity and culture in the Brantford community.